June 2, 2016—It has been one year since I became your president at SDORC, and the fight to protect off-roading never seems to get easier. 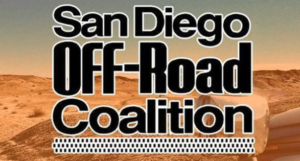 A number of things are happening with SDORC and off-roading in our area. First, I would like to thank our new webmaster, Jim McGarvie, for taking over the website. You should see updates more often now as well as a more streamlined site. Audrey Mason is once again leading our Lost Lizard Fun Run. We have already had a couple of meetings and are looking forward to another great event in the Superstition Mountain area on November 5. We are working on getting demos rides from Polaris and KTM. Hopefully they will come through for us. We are talking about putting on an off-road expo next year at Lakeside Rodeo grounds similar to the one we held about six years ago. If you would like to help put on either of these events, please contact us at info@sdorc.org. Now the bad stuff. The reason we are at Superstition and not Ocotillo Wells is because of a lizard an environmental group is trying to get listed as endangered in California. We should know the fate of this in August. Also, there is a bill we are supporting to stop the legislature from taking $10 million a year from the OHV fund in Sacramento. It is AB2175 and on June 1 it passed a general vote in the State Assembly. Next we have to get it through the State Senate and then signed by the Governor. We have been fighting to keep Carveacre Road open in a process the Cleveland National Forest has been working on. We fought like crazy, all the way to filing a formal Objection with the Forest, but in the end we were unable to prevail. We have a few tricks up our sleeves yet, but it doesn’t look good. You can like us on Facebook and read our monthly column in S&S Off-Road Magazine.